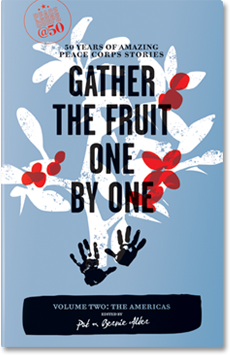 Gather the Fruit One by One brings together stories from 50 years of Peace Corps service in the Americas. From those first days, beginning with Colombia One, Volunteers began bringing home their stories about living and working with our nearest neighbors. The countries and cultures south of our frontera have since 1961 tested our assumptions and lit up the complex mixture of indigenous, European, and African languages, food, music, dance, and religion that makes up the Americas. What seems familiar often is not. Theses stories take you to journeys to the Amazon basin, to a Honduran village terrorized by the army, and to the playing fields of Ecuador for an unusual game of beisbol. To say “I was there” sometimes catches in the throat like a well-loved old song that aches with history and hope. This captivating collection of stories—the second in a series of four—once again allows readers to feel the extraordinary power of America’s grassroots peace offering.